Far from embracing nonviolence as a moral imperative, Mark and Paul Engler argue for its strategic application in political conflict for a simpler reason: it works. As the Englers point out in their new book, This Is An Uprising: How Nonviolent Revolt Is Shaping the Twenty-First Century, strategic nonviolence boasts a long history of political accomplishment even in the face of violent opposition. To be sure, research comparing violent and nonviolent movements confirms that the latter are nearly twice as likely to succeed as the former. Yet despite this rich history of struggle and progress, strategic nonviolent action has been rent by schism. The debate chiefly plays out between advocates of a structure-based approach who emphasize the need to build organizations that can sustain movements and consolidate gains, and those who agitate for disorderly disruption. The two camps aren’t easily reconciled. Critics of disruption, while admiring of the energy it creates, frequently worry that popular protests may explode onto the scene but quickly fizzle. Viewed from this perch, meaningful change demands slow and steady organization, clearly defined leadership structures, and the continuous mobilization of resources and popular support. This Is An Uprising unpacks this historical division, examining the strengths and limitations of each approach, as well as examples where hybrid models have been advanced. They cover considerable ground along the way—historically, geographically, and intellectually. From Gandhi’s Salt March and civil disobedience actions led by Martin Luther King, to student-led uprisings against violent authoritarianism in Serbia and Egypt to the progress won by advocates of LGBTQ rights in the United States, This Is An Uprising takes stock of what works and why, and seeks to tease out lessons that can be applied in future moments of confrontation. Michael Busch: Yours is a sophisticated, carefully argued book with a bunch of moving parts. But ultimately it all boils down to a straightforward argument: that skillful harnessing of non-violent, momentum-driven mass mobilization can be critical to driving social change. Can you begin by unpacking what you mean by "momentum-driven mass mobilization" and talk about why it's potentially so potent? 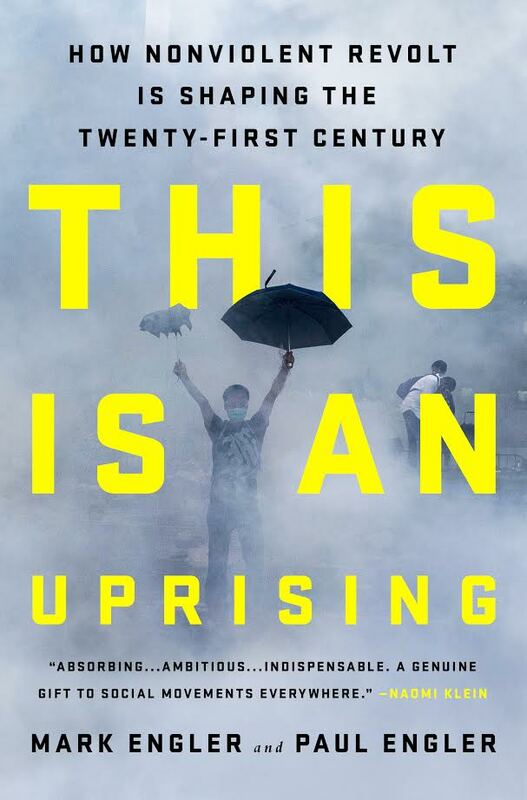 Mark Engler: This is a book about how protest movements work, how they create change outside the formal political system. And it’s about how organizing around mass mobilization—mass protests—is different than other types of organizing. The first component of that is talking about working outside the formal mechanisms of politics. In an election year, we get it crammed down our throats that social change comes from electing the right person, having the right person take office. Even outside of an election year, we’re told that democracy is about working within the system, using the tools of the system to affect change. One of the fundamental ideas of social movements is that the system is often dysfunctional for a majority of people, and that progress within the system is in fact not providing the type of change that we need—that the system, in fact, is rigged in favor of the wealthy who can afford armies of lawyers and lobbyists. There’s the sense that to combat what Saul Alinsky called "the power of organized money" we need "the power of organized people." But even among those working outside the realm of formal politics, there are competing ideas for how to go about fostering change. One of the things my brother and I observe in the book is that there has been a divide in the activist and organizing world between a vision of creating change based on building up institutions and organizations, on the one hand, and the power of disruption and mass protest, on the other. We experienced this in a personal way. Both Paul and I were part of the global justice movement—or what the media called the "anti-globalization" movement. I was in Seattle for the mass protests against the World Trade Organization; Paul and I were in Washington, DC in April 2000 for the protests targeting the International Monetary Fund and the World Bank, and we took part in civil disobedience there that landed us in jail for the better part of a week. That movement, and those mass protests, and the ways they changed the development debate were important experiences for us. It was a moment where we really felt the tremendous energy of mass movements. But at the same time, that energy dissipated and died off after a while. It was disorienting, and we spent time trying to figure out why that happened. We wanted discover what was going on with the rise and fall of that intensive kind of activity and energy. At that point, Paul was working in the labor movement with people in a longer-term, organization-building orientation, and together our experience of mass protest went on the back burner. Over the years, though, what we’ve noticed is that these outbreaks of energy and mass mobilization—revolts that feel like they’re once in a lifetime events—keep recurring. Following Seattle, there was a huge wave of protest that emerged around the war in Iraq in 2003. Then, in 2006, millions of people were out in the streets across the United States for immigrant rights. We saw it in 2011 with the Arab Spring and Occupy. In fact, these sorts of explosions keep happening, again and again and again. Since 2011, there have been countless examples: students rising up in Quebec and Chile; huge demonstrations in Hong Kong, Mexico and Brazil. We see that these moments that disrupt politics and speed up change are more frequent than commonly thought. Paul and I noticed that, when these things erupt, a lot of people that we respected most in the worlds of community organizing and labor organizing often didn’t have a lot to say. They said things like “these movements are too ephemeral,” “they don’t build organizations,” and “they don’t last long enough for us to count on them.” They were sort of dismissive of these movements and their power. In this respect, they mirrored the mainstream media, which looked on these moments of mass protest as spontaneous, emotional outbursts and then dismissed them as failures when they faded away. Paul and I wanted to ask a different question—what if we don’t treat these as historical flukes? What if we really looked at their dynamics and consequences, and studied mass mobilizations in a careful way? What if we could really illuminate the craft behind them? MB: Right. And one of the things that you and Paul grapple with, then, is the tension between social movement activism and structure-based community organizing. You conclude that meaningful progress demands linkages between both. How so? ME: One of the things we found is that that tension that we had experienced in our own lives between mass mobilization and organization building—between the traditions of "structure" and "mass protest," as we call them—is that that division actually has deep roots in social movement history. You can go back and see this across decades and countries. It’s a tension that arises repeatedly in social movements, between this vision of creating social change through the building up of organizations, as I mentioned before, and social change driven by the power of disruption. That was a distinction we wanted to draw out. We wanted to understand why that tension emerged, and what’s really behind it. We wanted to examine the different biases and perspectives of different organizing traditions. And, of course, one of the purposes of highlighting that tension is so it can be overcome. By recognizing these two main traditions, we hope that people can figure out ways in which they can work together and complement one another. We think different approaches to organizing can cross-fertilize, even if they are not always working together. Our hope is that they can at least play off each other in ways in which are mutually beneficial. The model we talk about in the book, “momentum driven organization,” is a way of doing mass protests in a more deliberate way, in way that helps that sustains these outbreaks of revolt over longer periods of time. For example, it's about looking to organize multiple cycles of uprising as opposed to one short-term outbreak. But it's also about doing mass protest in a way that is attentive to institutionalization, to how the energy of mass mobilization can be absorbed so it doesn’t just disappear, and how that can feed into people who are doing long-term work. ME: Right. One thing we talk about near the end of the book is this idea of a healthy social movement ecosystem. We recognize that there are a lot of different approaches that are needed to create social change. Ultimately we do need political insiders—organizations sometimes need a good lawyer, for example. We need long-term organization building, too. And we need mass mobilization. So part of this is a question of emphasis and priority. So much validation is given to the lawyers and operatives working within the legal system. So much attention is paid to electoral politics—people speculate years before an election ever takes place about who might run, who might the candidates may be, how the results may play out. We talk about insider lobbying and the wrangling of votes in Congress. These types of discussions go on endlessly, and yet when mass protest erupts, people are taken by surprise. They have very little to say about it. And that shows a bias. In this context, since so little attention is given to this type of social change, we think it justifies taking a more careful look. Mass protest is but one element in a wider ecology of change. But we believe it is critical that people understand those outbreaks of revolt, those moments that speed up history, that redefine our sense of what’s possible and necessary in our political system. MB: For example, #BlackLivesMatter. What's your sense of how BLM fits into this lineage, and the direction in which it's going? ME: #BlackLivesMatter is a perfect example of a movement that can be viewed through this lens of momentum-driven mass mobilization. The tools this movement is using—sacrifice, disruption, escalation—are typical of mass movement work, but not so much the organization-building side of the equation. These activists are carrying out traffic blockades, they’re interrupting events by political figures, conducting sit-ins and the rest. If we analyze the methods of how they’re capturing the public spotlight, sustaining momentum over time, and what the likely impact of what their activities will be, the framework we talk about in the book is a useful prism for looking at these questions. I’ll give you one example. One of the criticism of #BlackLivesMatters is that they don’t do enough of the inside game. People will say, "we agree with your cause, but we don't like your approach; you’re not going at it right." And "not going at it right" usually translates into not having specific pieces of legislation that you’re advocating, or not fixating on the details of policy proposals, not talking about what can realistically pass given the current climate in Washington. MB: This was essentially Hillary Clinton’s argument when she was confronted by BLM activists. ME: It’s the conventional viewpoint of how social change happens! But in fact, we have all sorts of detailed policy reports. The ACLU, for example, puts out very detailed, very carefully thought out reports on how we can end racially discriminatory policing, or how we can stop the militarization of policing. They put out reports year after year, and I'm grateful that they do. But the point is that we have proposals for policies—they’re there. These policy ideas, however, are routinely ignored. What BLM has done is to put the issues in the spotlight. It’s insisted that these social problems can’t be ignored as inconvenient concerns, but they are things that must become urgent priorities. They did this using the call of “Stop Killing Us.” They used a galvanizing moral appeal, combined with a very strategic, disruptive orientation. Having a broad, moral appeal was actually more effective than getting bogged down in the policy details. And, ultimately, the movement has had concrete policy consequences. You win specific reforms in the long run. Those dusty ACLU policy ideas that I mentioned before are now suddenly coming to the fore. People are considering them! They’re saying, “Oh yeah, we need special prosecutors in a variety of cases. We can’t rely on regular prosecutors who themselves depend on having a chummy relationship with the police. We can’t rely on these same prosecutors to pursue claims of police misconduct.” Black Lives Matter has won those kinds of battles. Body cameras is another demand—they were by no means the sole focus of the movement—and yet when the movement forced these issues into the public consciousness, politicians turn to things like body cameras as a means of restoring order and placating dissent. So authorities have agreed that more police interactions with the public should be recorded and monitored. This is, of course, not a panacea or an end-point of the movement. But it is an example of how already, without adopting a technocratic agenda, the movement has started to make a real impact. MB: Further afield, you look at the remarkable success of Otpor in Serbia. Talk a bit about what lessons Otpor’s successes teach us about momentum driven mass mobilization. It’s pretty remarkable. ME: In Serbia, you had an entrenched strongman, Slobodan Milosevic, the Butcher of the Balkans. Many believed he could not be ousted. OTPOR, a youth-based group, became a very important catalyst in bringing together civil society. They didn’t act alone, of course. But this group, using the tools of civil resistance, the tools of nonviolent protest, was able to do a number of important things in helping spur the mass uprising against Milosevic. In 2000, when Milosevic tired to skew a presidential election, he met with some half-a-million-people who rallied, who carried out strikes throughout the country. These actions ultimately forced Milosevic out. The reason my brother and I are particularly interested in that case, is that this was a situation in which there was reflection on how to bring together different organizing traditions—using some of the skills of structure-based organization-building on the one hand, and mass protest on the other. Some of the students who formed OTPOR came out of the tradition of university-based protest. In the years prior, the students experienced a number of anti-Milosevic protest waves where they brought out large groups of people and stirred up lots of energy. What they learned from these experiences, though, was that the energy only lasted so long—it dissipated rather quickly—and that expanding energy and excitement beyond student strongholds on campus was quite difficult. And while Milosevic was threatened by these moments of uprising, he ultimately figured out ways to consolidate his power and further crack down on media and the independence of the universities. Many of the students who emerged from these experiences of mass protest, much like my brother and I had during the global justice movement, felt a profound frustration and deflation. They were interested in building a model of nonviolent action that could be sustained over a longer period of time. At the same time, there were many young people who had been active within Serbia’s political parties—well-structured political groups which each had its loyalists, its ranks of activists, and its specific constituencies that it drew support from. Those who helped form OTPOR saw how these structures could be useful in reaching different groups in society, but at the same time they were reacting against the rigidity of those parties, the inability of those structures to look beyond parochial interests and harness the power of mass movement. OTPOR emerged out of a reflection on these two types of organizing traditions. It was a movement that used humor, designing all sorts of creative stunts to mock the regime and show the people that resistance was possible. But at the same time, the organizers were very good at absorbing the energy that these actions generated. They brought people into a very elaborate training program where Serbians could learn about their group, learn about the tactics of civil resistance, and then form their own chapters and carry out autonomous activities. OTPOR devised a tremendously effective and decentralized structure that allowed them to incorporate more and more people into their network. Over several years, OTPOR grew from a small effort to one that had reach and was being seriously repressed by the government. And it played an important role in rallying people around the prospect of a stolen election, joining with other civil society groups in an effort that ultimately drove Milosevic from power. OTPOR is of great interest, then, because it’s an example of the success that a hybrid structure of organization-building and mass protest can achieve when it finds synthesis. MB: By way of contrast, there is the January 25 uprising in Egypt, which arguably failed to affect change and then sustain it. Do you think that's a fair assessment of the people’s uprising in Tahrir? And what are the lessons that can be drawn from the Egypt’s experience of the Arab Spring? ME: The situation in Egypt is very bad at the moment, there’s no doubt about it. The country is under the control of a repressive government, many of the protest leaders are in jail, or have fled. In some ways, the human rights situation is just as bad, if not worse, than it was during the Mubarak era. Given this, some critics adopt an extremely cynical view, arguing that it would have been better if protesters hadn’t spoken up, if people had never rebelled. I disagree with that line of argument. Despite its limitations, the January 25 movement was a tremendous act of hope and courage, and is something offers a lot of lessons, and it highlights the need for a healthy ecology of change. Momentum-driven mass mobilization can accomplish some amazing things. Scrappy groups leading campaigns of civil resistance can initiate things that some of the better organized, more effectively structured groups can’t always do by themselves. In this case, we ask why the Muslim Brotherhood wasn't the group that sparked the revolution. By all accounts, the size of its membership, the reach of the organization, and the amazing infrastructure the group had built throughout the country would have made the Brotherhood the logical sponsor of the revolution. But it wasn’t them—they weren’t the ones who instigated it. Instead, these small, start-up groups provided the catalyst that drove people into the streets. Once a mass revolt was underway, the more established groups had to decide whether they were also going to come out in support of the revolution. There was some hesitation before the Brotherhood did, in fact, join the uprising and ended up playing an important role. This kind of thing is actually not uncommon. Here in the United States, in the case of the Civil Rights Movement, it was the students who launched the lunch-counter sit-ins who prodded the more established, more conservative civil rights organizations into a more active posture where they were embracing these mass protests. And there are reasons for this pattern. Major "structure-based" organizations have assets that can be seized by police; they have clear leaders who can be targeted, arrested, and brought to trial; they have contractual responsibilities to members that must be honored, and so on. It’s these institutional features of well-organized groups that renders them hesitant to undertake highly disruptive and confrontational action. Egypt is a great example where small groups of protesters can activate more established political actors and set the tone for a mass revolt. Yet at the same time, once the government was overthrown, many of the things that worked in the favor of those smaller groups—their flexibility, their focus on galvanizing broad public outrage rather than haggling over organizational turf—started to work against them when the regime fell and political parties began jockeying for control. The Muslim Brotherhood, with its established infrastructure, was able to assert itself as a dominant political actor in the post-revolutionary moment, in a way that fractured the earlier coalition. And later the military—another highly-structured group—was able to take control and ultimately seize back the government. We see the January 25 movement, then, as a case that demonstrates the great power of momentum-driven mass mobilization, but also one that highlights their limitations and the need for different types of organizing to work in tandem. MB: This is An Uprising tends to assume a progressive/Left political orientation. I’m wondering where conservative moments fit into all this, if at all. To what extent can conservative victories—at least in the United States—be understood through the model you’re advocating? Or do conservative movements operate fundamentally differently? ME: That’s a good question. Our discussion in the book really tries to focus on the level of organizing traditions, or different frameworks for how people go about making change. There’s a certain sense in which these traditions are non-ideological. It's sort of like someone writing about the dynamics of guerilla warfare—if someone really broke down a model of using armed uprising—that person might have a specific ideological orientation. But the model that they describe could potentially be used by people with widely different agendas. As we know, guerilla warfare has been used by both left-wing groups and right-wing groups. Similarly, Saul Alinsky saw himself as a progressive, but his model of community organizing has been used by different types of groups. There are examples where people come together to advocate very progressive ends, but there are also examples where people have come together to organize campaigns around exclusionary, “not in my backyard”-style demands. In the same way, when we’re talking about traditions of civil resistance—and models for how to use nonviolent direct action that creates mass uprising—these are organizing methodologies that can be used by a wide-range of different groups. If you look at the history of nonviolent direct action, it includes a lot of progressive causes, but it also includes things like Operation Rescue, which employed civil disobedience to block access to abortion clinics. But if we look at the ideological content of civil resistance, one thing that I would say is that it is democratic, small-d democratic. It is ultimately premised on winning the support of the majority of the population. These movement rise and fall based on their ability to win active, broad-based public support. Victories can’t be sustained without that. There have been some who treat civil resistance as some sort of conspiracy. For example, in Venezuela, the right-wing student movement took an interest in the literature of civil resistance. Left-wing conspiracy theorists jumped all over this, arguing that Gene Sharp—a leading theorist of civil resistance—must be a tool of the CIA who just wants to overthrow governments the United States doesn’t like. Indeed, Hugo Chavez made just this accusation against Sharp, as did Ahmadinejad in Iran. But, of course, civil resistance has been used against all sorts of U.S.-backed regimes. Sharp wrote back to Chavez and said, in effect, you can use civil resistance to defend a popular government from attack just as easily as you can use it to unseat an unpopular or undemocratic government. In fact, Sharp wrote a book called The Anti-Coup, which looks at ways to prevent a coup by a minority of the population that doesn’t have a majority of popular support. The organizing tradition itself has a democratic bias, even if nonviolent direct action can potentially be used by groups with all sorts of different goals and agendas. MB: Finally, I’m wondering what you and Paul believe constitutes the biggest threat to successful efforts at strategic nonviolence. Is it the prospect of armed uprising? Or is it something simpler, like public complacency? ME: On the question of violence, we make a distinction between pacifism, or "principled nonviolence"—which sees nonviolence as a moral principle, something we are not focused on in our book—and "strategic nonviolence," which we make a case for in our writing. All sorts of people adopt strategies of nonviolent conflict and escalation for practical reasons. They assess their political reality and come to the conclusion that they are simply not going to succeed by taking up arms—that military action won’t work for them. There's a reason for that. Oppressive governments are often very good at using coercive force to quash movements, and they are primed and ready to take on armed uprisings, using the specter of violent insurgency to justify their repression. In contrast, nonviolent direct action frequently has the effect of throwing oppressive governments off-guard with its asymmetrical approach to resistance. You’re absolutely right about the role of apathy, though. Gandhi was clear on this point, arguing that cowardice and complacency in the face of oppression are the greatest sins. Fortunately, there is a tremendously broad toolkit that people using nonviolent direct action can access—sit-ins, building occupations, all sorts of boycotts and workplace strikes, up to and including general strikes—all those things, coupled with the tools of art and creative resistance. It’s an incredible range of possible action that people can use to disrupt the status quo and create dramatic confrontations. And we are making a strategic argument for why that makes sense. Mark Engler is an author and journalist based in Philadelphia. Mark is an editorial board member at Dissent, a contributing editor at Yes! Magazine, and a senior analyst with Foreign Policy In Focus. Additionally, Mark serves as a monthly columnist for the Oxford, UK-based New Internationalist magazine. An archive of his work is available at DemocracyUprising.com.